Texto en inglés. Tapa dura con plateados en lomo y sobrecubierta de editorial ilustrada.. Como nuevo. Valuation, University Edition, Sixth Edition, is filled with the expert guidance from MKinsey Company that students and professors have come to rely on. New to the fully revised and updated Sixth Edition: New case studies that clearly illustrate how vital valuation techniques and principles are applied in real-world situations Expanded content on advanced valuation techniques New content on the strategic advantages of value-based management that reflect the economic events of the past decade For twenty-five years Valuation has remained true to its core principles and offers a step-by-step approach to valuation, including: Analyzing historical performance Forecasting performance Estimating the cost of capital with practical tips Interpreting the results of a valuation in light of a company s competitive situation Linking a company s valuation multiples to the core drivers of its performance The University Edition contains End-of-Chapter Review Questions, helping students master key concepts from each chapter. Wiley also offers an Online Instructor s Manual with a full suite of learning resources for professors and students. McKinsey & Company's #1 best-selling guide to corporate valuation, now in its sixth edition Valuation is the single best guide of its kind, helping financial professionals worldwide excel at measuring, managing, and maximizing shareholder and company value. This new sixth edition provides insights on the strategic advantages of value-based management, complete detailed instruction, and nuances managers should know about valuation and valuation techniques as applied to different industries, emerging markets, and other special situations. Valuation lies at the crossroads of corporate strategy and finance. In today's economy, it has become an essential role and one that requires excellence at all points. This guide shows you everything you need to know, and gives you the understanding you need to be effective. * Estimate the value of business strategies to drive better decision making * Understand which business units a corporate parent is best positioned to own * Assess major transactions, including acquisitions, divestitures, and restructurings * Design a capital structure that supports strategy and minimizes risk As the valuation function becomes ever more central to long- and short-term strategy, analysts and managers need an authoritative reference to turn to for answers to challenging situations. Valuation stands ahead of the field for its reputation, quality, and prestige, putting the solutions you need right at your fingertips. "The best valuation book just got better. This edition's greater emphasis on what drives value and how to measure it will improve the way practitioners conduct financial analysis and, ultimately, make strategic decisions. It is required reading for all executives." "The bible in its field. Anyone wanting to understand what drives corporate value should read this latest edition." "The book's clarity and comprehensive coverage make it one of the best practitioners' guides to valuation." Valuation DCF Model Download: is available as a download (978-1-118-87374-8) on www.wiley.com. It is also available via flatpack (978-1-118-87366-3) at online bookstores. This interactive version of McKinsey's DCF Valuation model allows readers to conduct, with the guidance of McKinsey's valuation techniques, their own valuation analysis of companies. 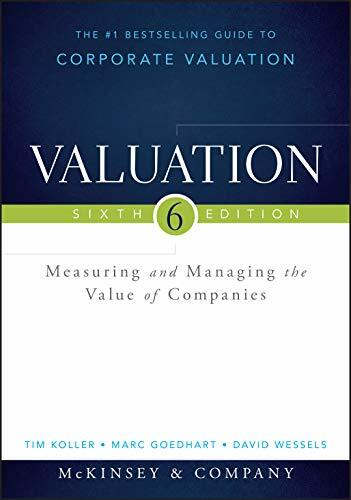 Valuation Workbook, Sixth Edition: Part of McKinsey's esteemed Valuation approach, this companion workbook (978-1-118-87387-8) is a must-have guide to reviewing and applying the valuation concepts and techniques discussed inValuation, Sixth Edition. Value: The Four Cornerstones of Corporate Finance (978-0-470-42460-5) offers an executive overview of the core concepts of corporate finance and their ties to value. Intended for managers and students, this accessible guide offers a solid foundation to valuation. Wessels, David, Goedhart, Marc, Koller, Tim, McKinsey & Company Inc.